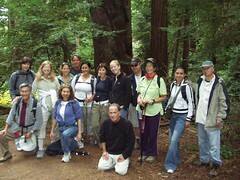 Our "Simply Wild" group on the last day at Julia Pfeiffer-Burns State Park. Perfect weather at Big Creek, a cold swim, wild turkey feathers, stories about living and "dead" redwoods, Esselen Indians, birthday wishes, hot springs, whales off the coast, bare attention, being idle and blessed, silence, heartfelt talks, open to the unfolding of each moment. Thanks to all for you participation, for doing the "hokey pokey" and putting your whole self in! Click on the photo to see more group photos from the hike.